Music Department doctoral student Maho Ishiguro received a $2,300 grant from the Society for Asian Music in October 2013. 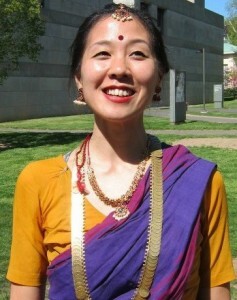 Ishiguro will use the grant for her research on the booming popularity of Achenese dance traditions among high school girls in Jakarta, Indonesia. Ishiguro, of Tokyo, Japan, moved to the U.S. when she was a junior in high school. This is her second year studying ethnomusicology at Wesleyan. Grant Applicants must be full-time graduate students enrolled in U.S. institutions and may use these funds to supplement other grants. Grants are to be used for research, including fieldwork, pre-dissertation research, travel, language study, and other related activities. The Society of Asian Music aims to cultivate, promote, foster, sponsor, develop and disseminate among its members and to other interested persons an appreciation, understanding, interest, taste and love of the music, and arts ancillary to music, of Asia; to create a center for the advancement of such purposes and to maintain the same to secure the interest of patrons of these arts; to encourage the composition of such music so as to provide social and aesthetic activities, and provide entertainment and amusement and the exploitation of such talents. Aaron Paige, also a doctoral student in music, received the grant in 2012.